We fly direct to Auckland from more Australian ports than anyone else. You'll enjoy great kiwi hospitality and unrivalled local expertise as soon as you hop on board. When you get there, taste fine wine and food at one of the 30 vineyards on Waiheke, explore the black sand beaches of the West Coast or walk amongst the clouds up the iconic Sky Tower. 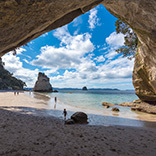 Discover the wonders of Auckland's rugged west coast landscape. There's so much to see and do. Visit the famous cliff-top gannet colony, where around 1200 pairs of gannets nest from August to March. The viewing platforms dotted along the coast give you sweeping views far over the Tasman Sea. Stroll along the boardwalks that hug the coastline and breathe in the crisp sea air alongside the wild waves and rolling black sand dunes. Keen to get active? Take a lesson at the local surf school or hire blokarts, kites, mountain bikes or surfboards, play a round of golf at the nearby course or go sliding down the sand dunes at Lake Wainamu. You can even see some amazing Māori carvings at the world famous Lion rock formation on Piha Beach. Discover lazy days, vineyards, olive groves and beautiful beaches – all just a 40-minute ferry ride away. There's a reason Waiheke Island was named one of the world's top 10 regions to visit for 2016 in Lonely Planet's Best in Travel guide. Waiheke is home to 30 wineries and vineyards nestled into the landscape. Join a guided tour for tastings of award-winning wines and relax over a delicious vineyard lunch. There are some stylish eateries in Oneroa village well worth a try too. This one's not for the faint-hearted. The SkyWalk is a new adventure activity where you can take an informative journey around the ring of Auckland's famous SkyTower and get the best possible views of the sparkling harbour and many landmarks from 192m (630ft) above the ground! Adventurers experience the heightened sensations of being outside the observation decks on a 1.2m walkway, with absolutely nothing on either side except a 192m drop off. There are no handrails on this walk - just a full body harness and overhead safety lines to keep you safe. You are there beyond the realm of the window cleaners - actually being part of the view. SkyWalk operates daily from 10am to 6pm, bookings recommended.